Over the years Langford Rae O’Neill estate agents has acted for many well known named developers on both land acquisition and selling the finished new homes. The director of the company specialises in advising individual owners on the potential of their properties from demolition of an existing house to redevelop, selling off part of a garden to form a separate building plot or simply adding value by extending an existing property. 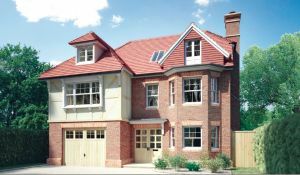 We can provide a number of professional services including Land valuations and off plan new homes evaluations and can give recommendations in respect of architects, builders and lawyers specialising in land matters. We have no ties to any individual developer and can offer truly independent advice. If you are unsure whether your property may have development potential then the Director of Langford Rae O’Neill, Chris Lingard, would be delighted to talk to you on 01732 740745. We have highlighted just some of the Land and New Homes developments we have been involved with below. 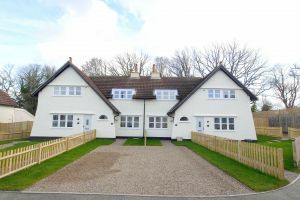 Available to the market for the first time in over one hundred years, Garden Cottages is a private development of twenty two houses located around a communal green which have been extensively refurbished and extended by the current owners. Built in the Arts and Crafts style as workers cottages, the current developers have beautifully extended and modernised the properties to offer light and airy accommodation combined with the comforts of modern living. A stunning, brand new, two bedroom second floor apartment, finished to a high specification situated on the popular Ryewood development in Dunton Green, adjacent to Sevenoaks Wildlife Reserve. An impressive 1548 sq ft brand new four bedroom detached family house situated on the popular Ryewood development built by Berkeley. Special attention has been given throughout the design of the home to create a light and spacious contemporary interior with a superb specification to match, arranged over three floors with integral garage and landscaped gardens to the rear. 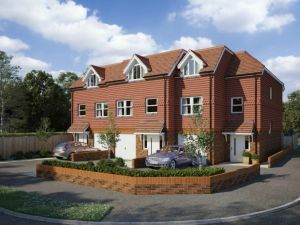 An impressive 3,131sq ft brand new four / five bedroom detached family house being built by well known local developer Kentmere Homes, offering flexible accommodation arranged over three floors. Estimated completion would be for the summer of 2019 so a purchaser, at this early stage, can influence the internal specification such as kitchen layout, tiles, fireplaces, internal doors and paintwork (all to a set budget). Alternatively the developer may consider selling the plot with a build contract for even greater flexibility and a saving on stamp duty. Special attention has been given throughout the design of the home to create a light and spacious interior with a superb specification to match. 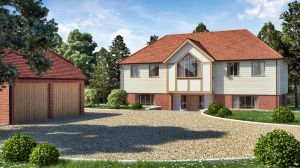 One of an exclusive development of four brand new detached houses measuring approximately 5,141 sq ft offering five bedrooms with light and airy contemporary accommodation arranged over three floors and spectacular far reaching views. 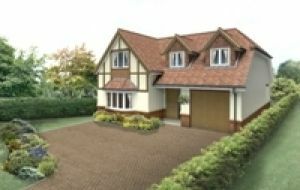 There is a double garage and beautifully landscaped gardens to front and rear. Special attention has been given throughout the design to create a spacious interior with a superb specification to match. 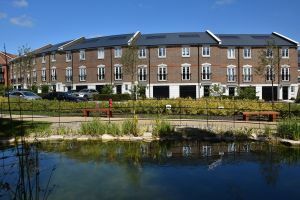 One of three brand new town houses built by local developer Kentmere Homes conveniently located for Sevenoaks main line station and measuring approximately 1962sq/ft. The accommodation is arranged over three floors and finished to a high specification. To the ground floor there is the Garage, Entrance Hall, Cloakroom and impressive Kitchen / Dining / Family Room with bi-fold doors leading to landscaped gardens. To the first floor is the Living Room, Bedroom 3, Study / Bedroom 4 and a Bathroom, whilst to the second floor there are two more bedrooms both with en-suite facilities. One of three brand new town houses currently being built by local developer Kentmere Homes and due for completion February 2018. Conveniently located for Sevenoaks main line station and measuring approximately 1656sq/ft. One of three brand new town houses currently being built by local developer Kentmere Homes and due for completion February 2018. Conveniently located for Sevenoaks main line station and measuring approximately 1507sq/ft. 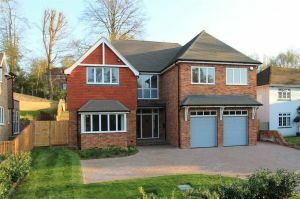 An impressive 3248sqft brand new five bedroom detached family house with contemporary accommodation located on the popular south side of Sevenoaks with integral double garage and southerly facing sloping garden. Special attention has been given throughout the design of the home to create a light and spacious interior with superb specification to match. A brand new two bedroom end of terrace house finished to a high standard throughout, offering bright and spacious accommodation, situated in a tucked away location and with the benefit of a delightful landscaped garden and driveway providing off road parking. 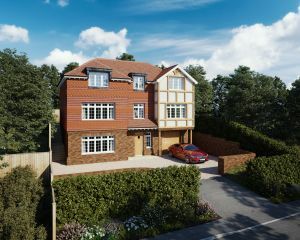 Acer House presents a rare opportunity to acquire a luxurious brand new detached home finished to a very high standard on a sought-after private road in Sevenoaks. With approximately 3,722sqft of living space, the ground floor offers an impressive entrance leading to a generous kitchen/dining/family room and separate utility room, catering for a variety of lifestyles. In addition to this flexible living space, the property also offers a study, cloakroom and formal drawing room with feature fireplace. The galleried landing on the first floor leads to 3 well appointed bedrooms complete with en-suites/shower rooms, with the master bedroom and guest bedroom also benefitting from walk-in wardrobes. A feature terrace also extends to the front of the property from the master bedroom. The second floor features two further generously proportioned bedrooms and a bathroom, with both rooms perfectly suited to adapt to flexible living requirements. Outside, the property occupies a generous plot and offers a detached double garage with landscaped gardens. Built by a well-respected local developer with a proven track record in delivering exceptional homes, this property is due for completion in early 2017 but is available to secure off-plan now. 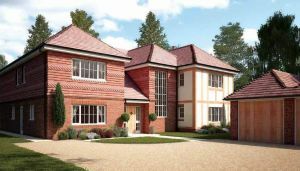 Cypress House presents a rare opportunity to acquire a luxurious brand new detached home finished to a very high standard on a sought-after private road in Sevenoaks. With approximately 3,722sqft of living space, the ground floor offers an impressive entrance leading to a generous kitchen/dining/family room and separate utility room, catering for a variety of lifestyles. In addition to this flexible living space, the property also offers a study, cloakroom and formal drawing room with feature fireplace. The galleried landing on the first floor leads to 3 well appointed bedrooms complete with en-suites/shower rooms, with the master bedroom and guest bedroom also benefitting from walk-in wardrobes. A feature terrace also extends to the front of the property from the master bedroom. The second floor features two further generously proportioned bedrooms and a bathroom, with both rooms perfectly suited to adapt to flexible living requirements. 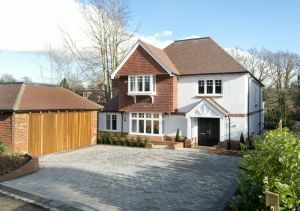 Outside, the property occupies a generous plot and offers a detached double garage with landscaped gardens. 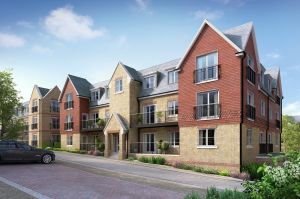 Built by a well-respected local developer with a proven track record in delivering exceptional homes, this property is due for completion in early 2017 but is available to secure off-plan now. A brand new house located on the outskirts of the popular village of Otford, the property is set on a generous plot extending to approximately one third of an acre with mature landscaped gardens. The accommodation is arranged over two floors with a large loft space should someone wish to convert in the future. To the ground floor there is a spacious kitchen/breakfast room with separate utility, separate dining room, study and family room with doors out to the garden, a superb dual aspect drawing room with fireplace and once again, doors to the garden and separate cloakroom. To the first floor there are five bedrooms all with fitted wardrobes, the master suite has an ensuite bathroom and dressing area, there are two guest suites both with ensuite shower rooms and additional family bathroom. Externally the property is set back from the road with extensive off road parking and detached double garage. The house measures approximately 3,580 sq ft and is estimated to be finished by Christmas 2016. 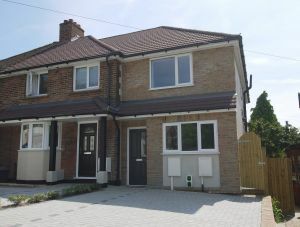 A delightful brand new end of terrace house conveniently located for Sevenoaks mainline station. The property is built by a well known local developer and offers spacious and light accommodation arranged over two floors. To the ground floor there is the living room, cloakroom and spacious kitchen/diner with bi-fold doors to the rear and roof lantern above. To the first floor there are two double bedrooms and bathroom. Externally there is a small landscaped rear garden and garage with off road parking. It measures approximately 750 sq ft plus garage. A rare opportunity to purchase a brand new design and build opportunity located in the heart of Sevenoaks town. 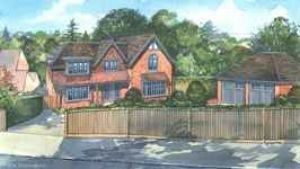 The site has planning permission for a five bedroom detached family house with accommodation arranged over three floors. To the lower ground floor there is an integral garage, spacious office, cloakroom, utility room, store room and spacious family room with second staircase leading up to an impressive open plan kitchen/breakfast room with bi-fold doors onto the garden, dual aspect living room with attractive feature bay window to the front and the master bedroom with en-suite facilities and fitted wardrobes. To the first floor there are four additional bedrooms, the guest suite with en-suite shower room and family bathroom. 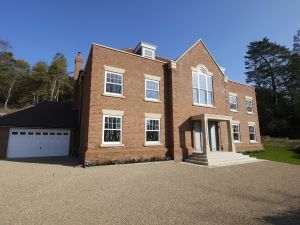 Externally there is off road parking to the front providing access to the garage and entrance porch; whilst to the rear there is a landscaped garden with patio running adjacent to the rear of the house and steps leading up to the majority of the garden which will be laid to lawn. The development will be built by a well known local developer, Kentmere Homes and will be finished to an extremely high standard. 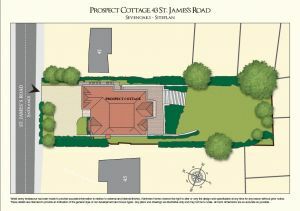 A rare opportunity to purchase a building plot located in the heart of Sevenoaks town. 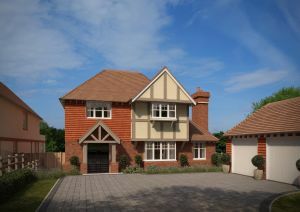 The site has planning permission for a five bedroom detached family house with accommodation arranged over three floors. To the lower ground floor there is an integral garage, spacious office, cloakroom, utility room, store room and spacious family room with second staircase leading up to an impressive open plan kitchen/breakfast room with bi-fold doors onto the garden, dual aspect living room with attractive feature bay window to the front and the master bedroom with en-suite facilities and fitted wardrobes. To the first floor there are four additional bedrooms, the guest suite with en-suite shower room and family bathroom. Externally there is off road parking to the front providing access to the garage and entrance porch. A RARE OPPORTUNITY TO PURCHASE A UNIQUE CHALET STYLE HOUSE SET IN BEAUTIFUL MATURE LANDSCAPED GARDENS WITH PP FOR A REPLACEMENT DWELLING AND ADDITIONAL POSSIBILITY TO PURCHASE WOODLAND THAT WOULD EXTEND THE PLOT TO APPROX. 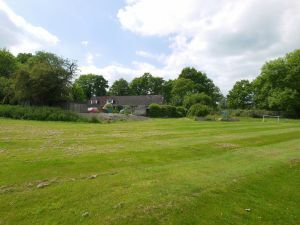 3.2 ACRES (TBC) The replacement dwelling, Planning Ref: TM/15/00137/FL, is a two storey house with living room, dining hall, kitchen, study and cloakroom to the ground floor, four bedrooms and two bathrooms to the first floor. A rare opportunity to purchase a unique New Build detached house located within easy walking distance to the town centre and main line station. Offering split level accommodation with 5 bedrooms and measuring approximately 4,072 sq ft. 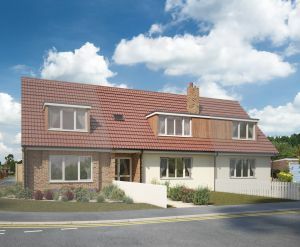 Brand new executive style family house built by local developers, Kestrel Homes, and built to a high specification including luxurious kitchen and bathrooms, underfloor heating throughout and solid walls and floors to both ground and first floors. The 24ft 7in kitchen/family room forms an impressive feature of the property with integrated appliances and bi folding doors to the rear and side leading out to the garden. There are two additional reception rooms, separate utility room and cloakroom to the ground floor, whilst to the first floor there are four double bedrooms, family bathroom and en-suite facilities to the master bedroom. Externally there is a single garage and attractive landscaped gardens to front and rear with direct access onto Bradbourne lakes.